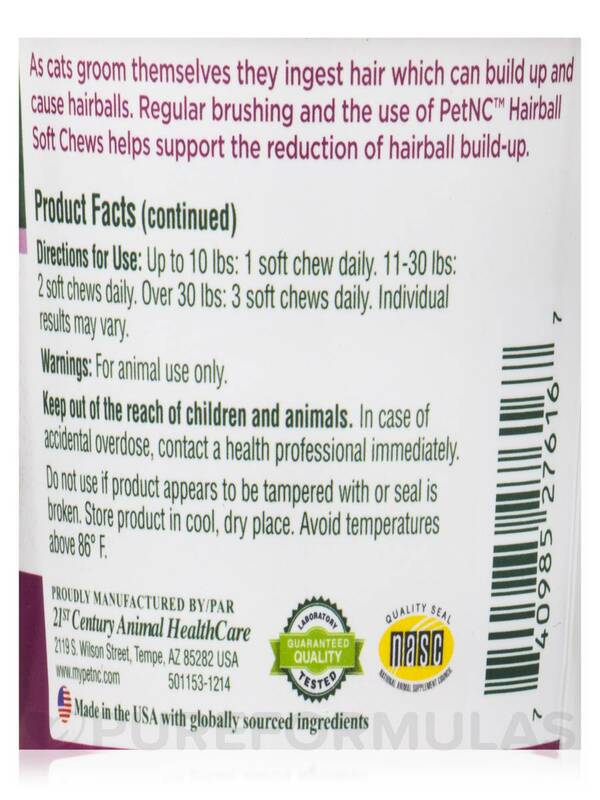 Cat loves Cat Hairball Soft Chews by PetNC Natural Care and they seem to be helping eliminate hairballs. I like that Cat Hairball Soft Chews by PetNC Natural Care are soft. I don't think my cat was fond of the smell or flavor. 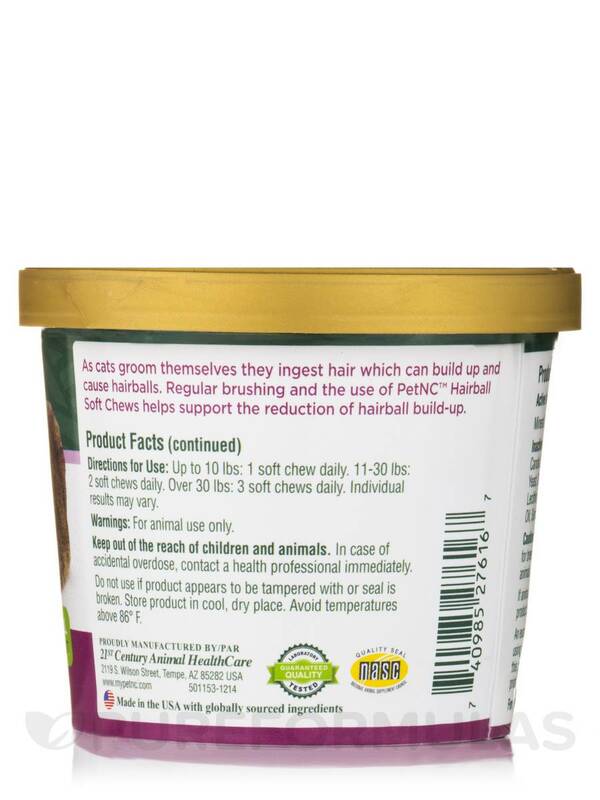 I give my cat a few of these Cat Hairball Soft Chews by PetNC Natural Care every day to help with hairballs. They seem to help him hack less. Inactive Ingredients: Calcium propionate‚ calcium silicate‚ canola oil‚ chicken liver meal‚ citric acid‚ dried brewers yeast‚ dried cheese‚ flavor enhancer‚ green tea extract‚ lecithin‚ mixed tocopherols‚ rosemary extract‚ salmon oil‚ sorbic acid‚ starch‚ vegetable oil‚ water. Laboratory Tested / Guaranteed Quality. Up to 10 lbs: 1 soft chew daily. 11-30 lbs: 2 soft chews daily. Over 30 lbs: 3 soft chews daily. For animal use only. Keep out of the reach of children and animals. In case of accidental overdose‚ contact a health professional immediately. Do not use if product appears to be tampered with or seal is broken. Store product in cool‚ dry place. Avoid temperatures above 86° F. Safe use in pregnant animals or animals intended for breeding has not been proven. 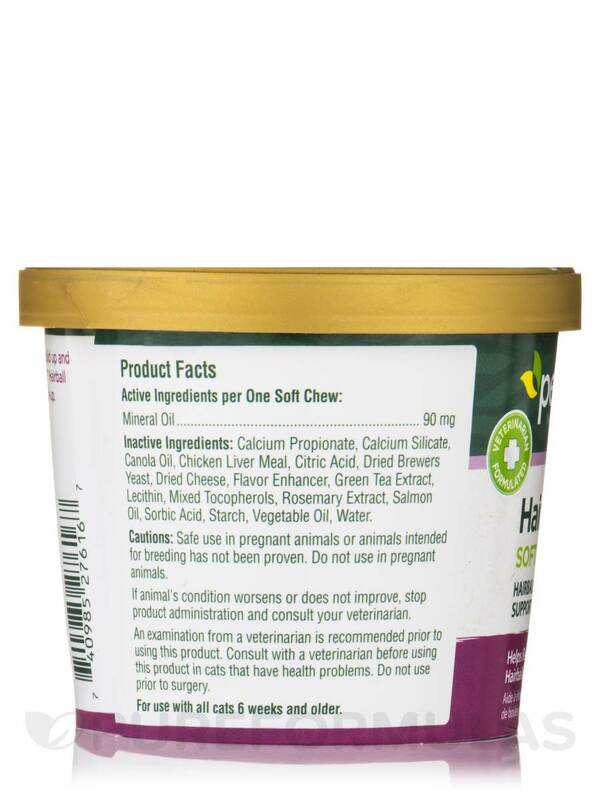 Do not use in pregnant animals. If animal's condition worsens or does not improve‚ stop product administration and consult your veterinarian. An examination from a veterinarian is recommended prior to using this product. 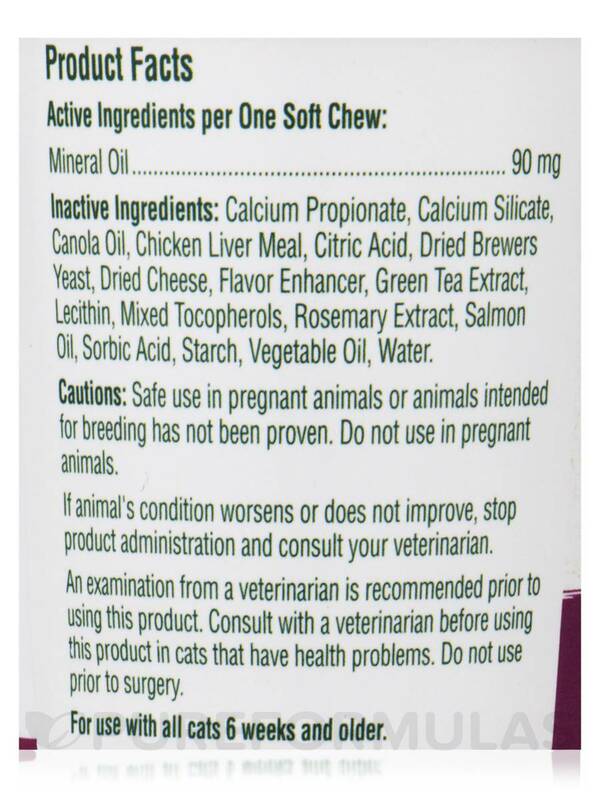 Consult with a veterinarian before using this product in cats that have health problems. Do not use prior to surgery. For use with all cats 6 weeks and older. Good price, and they stay soft even after the package is opened. My cats are very picky & they absolutely love the taste of these Cat Hairball Soft Chews by PetNC Natural Care. I normally have to force feed the tube type of hairball remedy & this I can just put in front of them. They look forward to their "treat" every day. I think Cat Hairball Soft Chews by PetNC Natural Care do the job as well as most hairball meds, but the best part is that cats seem to like them. Can't beat that. Cat Hairball Soft Chews by PetNC Natural Care smells awful and my kitty won't eat it no wonder. I’m so glad I bumped into Cat Hairball Solft Chews by PetNC Natural Care while searching on Google, to find a brand that works for my male cat, Nothing else worked. But he loves this brand. This is the only brand my cat will eat. He eats it up real fast. They Take it Like a SNACK! I have 2 cats that are really bothered with hairballs. They are very fussy. 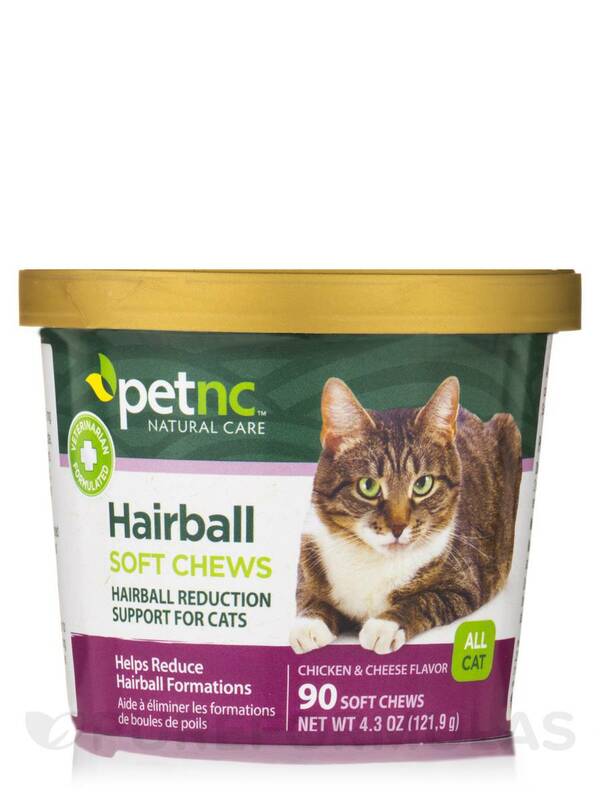 Cat Hairball Soft Chews by Pet NC Natural Care is something that they finally take! If it's not like a treat they won't have anything to do with it. And it seems to be helping out. I am very pleased with the results. I don't have to fuss with them about taking it. I wish it was without mineral oil, but the things I tried without mineral oil they didn't take so at least they take this. My cat would never take any other hairball remedy. But, she actually likes Cat Hairball Soft Chews by PetNC Natural Care and they seem to be helping. Seems to help ease hairballs! Kitty not fond of smell and flavor.